These modestly proportioned photo pieces are at once bewildering and haunting. 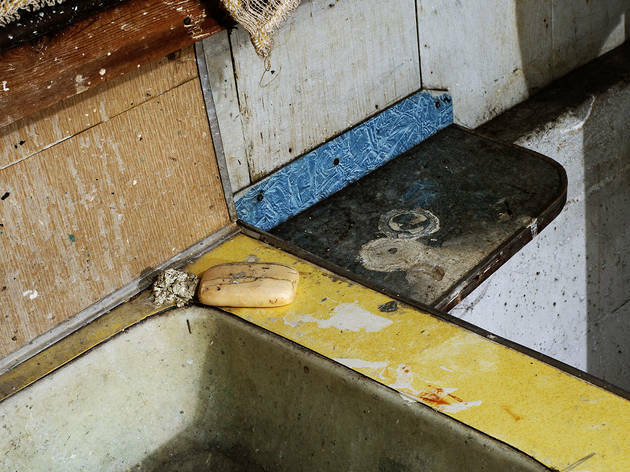 Best known for his ‘Transparencies’ series of outsize, glowing photographs, Canadian artist Jeff Wall has always focused on the creation of ambitious, grand-scale documentary works. Here, however, the Fondation Henri Cartier-Bresson has got its hands on 35 smaller pieces from the artist’s personal collection. 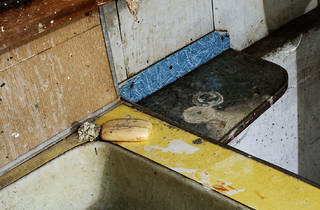 Among them, 14 smallish glowing boxes containing stunning, sordidly detailed still-life photos, like ‘Diagonal Composition’, which nostalgically depicts a battered old sink in his attic. The exhibit also highlights various impressionistic monochrome and colour prints (many of which were unplanned, unposed and captured on a mobile phone). ‘Searchers 2007’, for instance, recalls Georges Seurat’s blurred field workers and the contemporary paintings of Tim Eitel. In all of these works, rather than focusing on full-fledged characters and objects, Walls zooms in on the fragmented yet evocative details (an arm, a leg, a bare torso, a corner, a ray of light). The effect is at once bewildering and haunting: for the viewer, it’s like attempting to patch together the damaged memory of an amnesiac.